In the Premier Division, Wyberton Reserves beat rivals Railway Athletic 2-1, their goals coming from Will Nuttell and Jack Bastow. Morgan Randles scored the consolation goal for Railway. Benington finally moved off the foot of the table by beating Pointon 3-0, Tom Baxter (two) and Carl Wilson on target. Old Leake finished their season with a hard-fought victory at home to Ruskington Rovers. Sam Jackson put Ruskington ahead with a fine shot but Peter Sampson and a last-minute goal from Scott Mackay gave Old Leake the points. Division One’s top two met at Fishoft, but it was Woodhall Spa who took the lead just before half time. Fishtoft left it late to equalise, Liam Shinn netting with the last kick of the game. Park United travelled to Horncastle Town Reserves and came away with a 2-1 victory, Jimmy Harris and Alex Limb on target for Park. Fosdyke beat Swineshead Institute Reserves 5-2 and Old Doningtonians and Billinghay Athletic shared the points in a 1-1 draw. Division Two champions Eagle United beat Skegness Town A 5-1, Daniel Busch (two), Luca Hall, Tom Bates and Danny Woods on target for Eagle, while Mason Hazard scored the goal for Skegness. 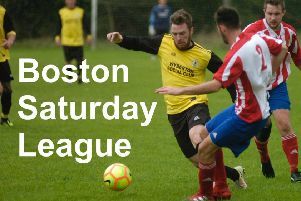 Boston Athletic had a excellent win against Spalding Harriers, Rafel Marczewski hitting the consolation in a 3-1 defeat. Northgate Olympic became Division Three Champions by beating Woodhall Spa United Reserves 4-1. In the other game, Park United Reserves drew 1-1 with Digby, Ryan Summers scoring the goal for Park and Simon Johnson hitting the net for Digby. In the BB Insure Willoughby Cup quarter-final, Kirton Town progressed to the semis after beating Spilsby Town 7-6 on penalties. The game finished 4-4 after extra time. Skegness Town Reserves beat Boston College 1-0 to go through to the final of the Willoughby Cup, Jordon Bloodworth scoring the only goal of the game.